This groundbreaking biography by Kevin Maney, acclaimed technology columnist for USA Today, offers fresh insight and new information on one of the twentieth century's greatest business figures. Over the course of forty-two years, Thomas J. Watson took a failing business called The Computer-Tabulating-Recording Company and transformed it into IBM, the world's first and most famous high-tech company. 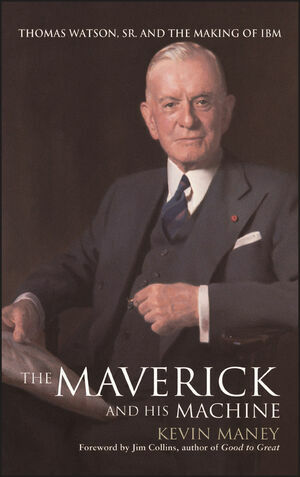 The Maverick and His Machine is the first modern biography of this business titan. Maney secured exclusive access to hundreds of boxes of Watson's long-forgotten papers, and he has produced the only complete picture of Watson the man and Watson the legendary business leader. These uncovered documents reveal new information about how Watson bet the company in the 1920s on tabulating machines-the forerunners to computers-and how he daringly beat the Great Depression of the 1930s. The documents also lead to new insights concerning the controversy that has followed Watson: his suppos ed coll usion with Adolf Hitler's Nazi regime. Maney paints a vivid portrait of Watson, uncovers his motivations, and offers needed context on his mammoth role in the course of modern business history. Jim Collins, author of the bestsellers Good to Great and Built to Last, writes in the Foreword to Maney's book: "Leaders like Watson are like forces of nature-almost terrifying in their release of energy and unpredictable volatility, but underneath they still adhere to certain patterns and principles. The patterns and principles might be hard to see amidst the melee, but they are there nonetheless. It takes a gifted person of insight to highlight those patterns, and that is exactly what Kevin Maney does in this book." The Maverick and His Machine also includes never-before-published photos of Watson from IBM's archives, showing Watson in greater detail than any book ever has before. Essential reading for every businessperson, tech junkie, and IBM follower, the book is also full of the kind of personal detail and reconstructed events that make it a page-turning story for general readers. The Maverick and the Machine is poised to be one of the most important business biographies in years. Kevin Maney is a nationally syndicated, award-winning technology columnist at USA Today, where he has been since 1985. He is a cover story writer whose story about IBM's bet-the-company move gained him national recognition. He was voted best technology columnist by the business journalism publication TJFR. Marketing Computers magazine has four times named him one of the most influential technology columnists. He is the author of Wiley's MEGAMEDIA SHAKEOUT: The Inside Story of the Leaders and the Losers in the Exploding Communications Industry, which was a Business Week Bestseller. KEVIN MANEY is a nationally syndicated, award-winning USA Today technology columnist. He was voted best technology columnist by the business journalism publication TJFR. Marketing Computers magazine has, four times, named him one of the most influential technology columnists. He is also the author of the BusinessWeek bestseller Megamedia Shakeout, from Wiley. Maney lives in Clifton, Virginia, with his wife and two children. Chapter 2: Lit by Flint. Chapter 3: A Mess Spelled C-T-R.
Chapter 4: Bringing Up Baby IBM. Chapter 5: Daring and Luck. Chapter 6: Friends, Heroes, Sycophants. Chapter 7: Enemies and Delusions. Chapter 8: King and Castle. Chapter 9: Watson the Second. Chapter 11: Old Man, New Electronic Age. Chapter 13: The Maverick and His Humanity. The story of Watson's transformation of the disorganized, amorphous Computing-Tabulating-Recording Company into steamlined, world-famous IBM receives a spirited telling by Maney, a USA Today technology columnist. Access to previously unexplored records has provided juicy raw material, including letters and internal memos, to bring America's first celebrity CEO to life in this wart-sand-all biography: Watson (1874-1956) saw the strategic value of corporate culture early and was protective of what he built; Maney argues that the strength of that culture later allowed IBM to survive the potentially devastating effects of Watson's personality flaws. Charismatic, optimistic and generous, Watson was also self-absorbed and psychologically ruthless in getting things done his way. Hard to work for and unable to distinguish between the company and himself, he also behaved like a dictatorial CEO when wreaked havoc with his family. Watson's mania for overreaching peaked when he accepted a decoration from Hitler in 1937 under the deluded impression that Hitler woul d follow Watson's ca mpaign for world peace through world trade; according to Maney, that episode illustrates how out-of-control Watson's ego had grown. Yet, as Maney makes clear in this timely tale of the man who made information into an industry and discovered the power of corporate culture, "Watson wasn't just the best business story at the end of the 1930s; he had become a great American success story that captured the popular imagination." Agent, Sandy Dijkstra. (May). WHEN Thomas J. Watson Jr., who ran the International Business Machines Corporation during its climb to dominance in the computer industry, published his memoirs in 1990, he called the book "Father, Son & Co." His father - who had taken over a motley assortment of business machine companies in 1914 while awaiting sentencing on a criminal antitrust conviction - loomed large in the story. Indeed, one reason the book has become a business classic is surely its poignant, child's-eye view of the flawed yet fascinating father who created I.B.M. and brought it to the brink of the computer age before passing it to his son, who died in 1993. The portrait of Thomas J. Watson Sr. in his son's memoirs had all of the misty myopia that accompanies any child's perceptions of a fearfully adored parent. One reviewer complained that "we hear too little of life within I.B.M. - and too much of Mr. Watson telling us how awful it was being his father's son." A much more lively and nuanced picture of the senior Watson can be found in Kevin Maney's excellent new biography, "The Maverick and His Machine: Thomas Watson Sr. and the Making of I.B.M." (John Wiley & Sons, $29.95). Enriched by access to Watson's personal papers from the I.B.M. archives, the book brings this complex man to life and provides a clearer sense of how the I.B.M. culture took shape around one man's quirks, preferences and iron whims. The company songs, the daily white shirts, the polish and pomp of corporate ceremonies - all of them were manifestations of Watson's own overcompensating insecurities. An awkward young man from a family with little money, he started out in a career that was the punchline of countless American jokes: the traveling salesman. Not until he was hired in 1896 by the National Cash Register Company in Dayton, Ohio, did Watson start to acquire the poise and polish that he would demand of his own executives decades later. But his career at "the Cash," under the tutelege of its chairman, John H. Patterson, was very nearly his ruin. National Cash Register had a virtual monopoly in the manufacturing and sale of its product, which was becoming increasingly popular among American retailers. Unfortunately, the machines were built so solidly that they rarely wore out. Companies selling secondhand cash registers began to steal business from it. So, in 1903, Patterson drafted Watson to run an elaborate scam. After ostensibly resigning from the company, Watson set up a chain of used cash register stores that was secretly backed by National Cash Register. By paying more for secondhand machines and selling them for less, Watson drove virtually all of Patterson's competitors out of business. He seems never to have doubted the legality of what he was doing. But when an angry ousted executive started talking to the Justice Department, the scheme figured in a 1912 federal grand jury indictment of Patterson and more than two dozen of his executives, including Watson. In February 1913, Watson, Patterson and all but one of the other executives were convicted of criminal antitrust violations. Watson, newly married, faced up to a year in prison. Somehow, in 1914, he nevertheless persuaded an unreconstructed trust-builder named Charles Ranlett Flint to hire him to try to save a rickety business-machine trust that Flint had assembled in 1911. The conglomerate included the Computing Scale Company of America, which made scales that calculated the price of products sold by weight; the International Time Recording Company, which made the time clocks on which workers punched in for the day; and the Tabulating Machine Company, which used punched holes in rectangular cards to sort information - "the forefathers of mainframe computers," notes Mr. Maney, a technology columnist for USA Today. FLINT called this ailing hodgepodge the Computing-Tabulating-Recording Company. And in a remarkable decision - one cannot imagine it being replicated in this post- Enron era - he hired the energetic and supremely confident convicted felon, Thomas J. Watson, to bring the company back to life. Watson, whose conviction was later overturned, succeeded beyond anyone's imagination, except his own. Seeing the future in his little tabulating-machine company, he invested lavishly in research and expanded wildly, even in the face of the Depression. Mr. Maney observes that "Watson borrowed a common recipe for stunning success: one part madness, one part luck, and one part hard work to be ready when luck kicked in." The book draws on extensive corporate records to capture Watson's self-absorbed monologues to his senior executives, giving the reader an immense sympathy for the men and women who endured them. With I.B.M. 's cooperation, Mr. Maney seems to have inspected every letter, memorandum and index card that passed through Watson's hands. But the bulkiness of the research only occasionally breaks through the elegant fabric of the storytelling.